Carry a little flower power in your pocket wherever you go. Protect your phone with this cute fair isle pouch. It’s sturdy, hard-wearing and even splash proof! Shannan from Bobbin and Fred shares a tutorial showing how you can make one. These really are not as hard as the look. 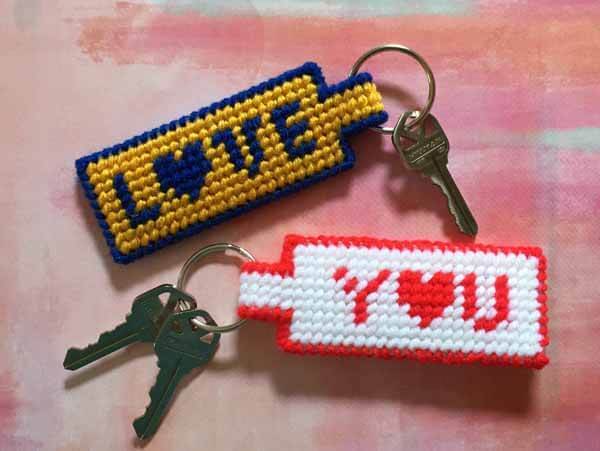 They are a perfect late night craft project as you try and unwind. It’s like adult coloring in but with thread. This Plastic Canvas chart is for a set of patriotic bookmarks. Perfect little gifts for school aged children. We came across this Plastic Canvas pattern with no links but after a little research it appears to be from this archived website. I really love these stitch samplers by Gingerbreadsnowflakes.com. The colors are amazing too. Not all the stitch information is there but there is enough photo’s to guide and inspire you. We came across this Snoopy pattern with no links but after a little research it appears to be from this archived website.